Clarets defender Charlie Taylor hurdles a challenge from Swansea City's Jordan Ayew. Clarets left-back Charlie Taylor says the team are “desperate” to end their poor run of form ahead of Saturday’s Premier League clash with Southampton. The hosts have picked up just five points from a possible 30 and are without a win since beating Stoke in December. Taylor, 24, has started each of the last 10 league games for Burnley and has yet to experience winning a game in which he has started. “I want to win as much as anyone. We all want to win but it would be good to get that one off my back”, he said. The winless stretch, which has included fixtures against Tottenham, Liverpool, Manchester United and Manchester City, has been tinged with a degree of misfortune but Taylor is confident that the Clarets can get back to winning ways. “At the start of the season we were getting it but I think it will come. Every team goes on a bad run during some stage of the season”, he added. With a weekend off due to FA Cup action, Dyche’s men took a trip to Portugal for some mid- season warm weather training, a trip Taylor admitted was good for team bonding. 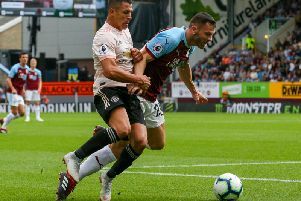 Unity amongst the squad is vital during tough periods in a season and talk of Burnley’s poor form has not affected the side, according to the defender. “Everyone talks about it from the outside. In the camp it’s not a huge issue but obviously every week all you want to get is three points, that’s the main aim”, he said. Despite ten matches without a win in the league, three points against Southampton at Turf Moor would keep the Clarets in seventh place. Although mathematically not safe, it would take a lot to go wrong for Burnley to finish the season in a relegation scrap and Taylor states the squad have got their minds set on a solid end to an impressive campaign. “We made an incredible start and we want to build on that and finish the season strong and get back to winning ways”, he said.